(l-r) Mr. Jeson LeBlanc, Ms. Urnesia Pemberton, Ms. Irvichal Challenger, Mrs. Dawn Jeffers [GSS’ Principal], Mr. Edson Elliott [CSS’ Principal], Mr. Spencer Hanley [representative for Nevis Association of South Florida], Ms. Earline Pemberton, Ms. Joanne Flemming and Mrs. Carla Liburd. 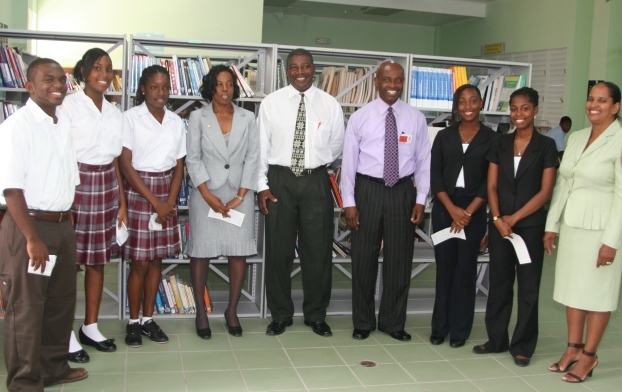 NIA – CHARLESTOWN, NEVIS (December 1ST, 2010) — Nevis’ 2010 top scholars were on Monday [Nov. 29] rewarded by the Nevis Association of South Florida for their outstanding science, mathematics and overall performances in the recent Caribbean Examinations Council [CXC] exams. Nevisians residing on Nevis and abroad, representative for the Nevis Association of South Florida, Mr. Spencer Hanley said he has always encouraged organisations and individuals to invest in Nevis’ youth. “Their main objective is to assist Nevisians, wherever they may be, in education. In 2009, the organisation made a donation to the Charlestown Secondary School’s scholarship fund. They have done a lot more too. Sometimes those persons who live overseas and those who live in Florida are in need and this organisation is always there to assist them,” Mr. Hanley said. Ms. Jonesia Brown, Ms. Irvichal Challenger and Ms. Urnesia Pemberton were the awardees from the Gingerland Secondary School [GSS] with Ms. Brown receiving a cheque for her top science results, Ms. Challenger for her top mathematics results and Ms. Pemberton for being the school’s top student. Principal of GSS, Mrs. Dawn Jeffers accepted the cheque on behalf of Ms. Brown. Mr. Jeson LeBlanc was the single awardee from the Charlestown Secondary School [CSS] as a result of his top results in science and mathematics and his top performance in the overall examination. Ms. A. Carol Liburd, Ms. Earline Pemberton and Ms. Joanne Flemming of the Nevis Sixth Form College received cheques for their science, mathematics and overall results respectively. Mrs. Carla Liburd accepted the cheque on behalf of her daughter; Ms. Liburd. Principal Jeffers and Ms. Flemming expressed their gratitude to the association. Mrs. Jeffers, like Mr. Hanley however, encouraged the organisation to continue to invest in the island’s young people. The brief ceremony was held in the school’s library and media centre.